This car looks and feels “class above,” and nothing about the SE model’s interior instantly identifies the Accent as the cheapest vehicle in the Hyundai lineup. On the surface, the Hyundai Accent is an impressive little car. It is stylish inside and out, built to unusually high standards using materials that are uncommonly good at this price point, and contains one of the most powerful engines in its class. Dynamically, though, the Accent is dissatisfying, and the car is unavailable with the kinds of infotainment and safety technologies that are becoming increasingly common in the entry-level class. From humble origins, Hyundai has dramatically expanded its lineup over the course of the past decade, and then some. From affordable small cars and turbocharged sport coupes to 3-row crossover SUVs and large luxury sedans, Hyundai offers something for just about everyone. The company has also broken a number of traditional rules on its path to success, from offering the best warranty in the business to selling luxury cars without a separate luxury brand. More than any other modern Hyundai, it is the entry-level Accent that is most closely tied to the very first car the company sold in America. What a difference a couple of decades make. Today, in terms of design and materials, the Accent is one of the most refined small cars for sale, something nobody of sound mind would have claimed about the original, and quite rudimentary, Hyundai Excel. 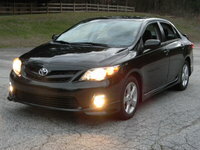 For 2013, the Accent is sold as a 4-door sedan or a 5-door hatchback. Sedans come in GLS trim, while hatchbacks are offered in GS or SE trim levels. Prices range from $15,340 for an Accent GLS with a manual gearbox to $19,435 for an Accent SE with an automatic transmission and every option. 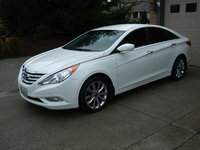 My test car was that loaded SE model, painted Ironman Silver with a black cloth interior. 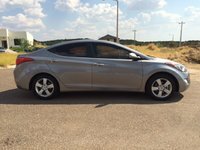 Regardless of the body style, the Hyundai Accent is an attractive little car, clearly drawn to the same flowing design tenets governing the appearances of the larger Elantra and Sonata models. My 5-door hatchback had a distinctively European flair to it, and the 16-inch, 8-spoke aluminum wheels give the Accent SE a premium look. The Accent’s interior is cleanly designed and laid out but offers plenty of character. Silver trim looks more like real aluminum than might be expected at this price point, and no matter which interior color you choose, the top of the dashboard and door panels remain black to reduce glare. These expanses of plastic have a waffle pattern and a matte finish, and in combination with Piano Black trim with chrome accents, collectively lend the Accent a premium look totally unexpected from cars in this class. My SE test car also had tastefully patterned, durable cloth seats, a softly padded sliding center console armrest, Berber-style floor mats, plush lining inside of its overhead sunglasses holder, and a headliner of decent quality. Not to sound too effusive here, but the level of quality inside the Accent, given the sticker price and vehicle class, is mighty impressive. Equipped with one of the most powerful engines in its class, the Accent has no trouble getting out of its own way. The direct-injected, 1.6-liter, 4-cylinder engine makes 138 horsepower and 123 lb-ft of torque, and buyers choose between a 6-speed manual gearbox and a 6-speed automatic transmission with a Shiftronic manual shift gate. My Accent SE Hatchback had the optional automatic, and based on my experience, if you can operate a clutch pedal, you’ll likely want to stick with the stick. That’s because the automatic is sharply focused on upshifting as rapidly as possible, and downshifting only if it is absolutely necessary, in what I conclude is an attempt to ensure that the car comes as close to hitting its EPA fuel economy ratings as it can. I suppose that if I had tested the Accent with its driver-selected Active Eco system engaged, the car might have had a fighting chance of achieving its combined-driving fuel economy rating of 31 mpg. Instead, I got 28.8 mpg in a mix of driving. Choose to shift the automatic transmission manually, using the Shiftronic gate, and you’ll find that it works intuitively. You push the lever up to upshift, and you pull the lever back to downshift. The gear selector is also remarkably satisfying to use, feeling more solid and refined than is expected in an inexpensive car. What would be really swell, though, is if this transmission offered a Sport mode. My bet is that would resolve my complaints about the standard shift programming. It would also be nice if this transmission had something similar to Honda’s Grade Logic Control. As it stands, the Accent picks up lots of speed going down a hill, and the transmission constantly hunts when driving up a hill. Yes, manual shifting resolves this. Still, I’d like a feature that can detect when the car is on a hill and automatically downshift the transmission as is necessary. Switching gears, so to speak, to the Accent’s electric steering, it feels natural when the car is driven in the city or on a twisty mountain road. In a straight line at higher speeds, however, it does not inspire confidence. That means that whenever you’re driving the Accent on the freeway or a 2-lane country highway, the steering feels disconnected on center, and effort levels just off center are high enough that it is hard for the driver to dial in the slight corrections that are always required, especially in crosswinds. It’s really quite unsettling. The Accent’s suspension needs a re-tune, too. On rough pavement, impacts are dealt with sharply, and in stark contrast to the car’s softer body motions, creating cognitive dissonance in the driver. The spongy ride quality doesn’t match the jitterbugging that is happening with the tires at the surface of the road. Additionally, the Accent tends to wallow on undulating road surfaces. If your local Hyundai dealer has nothing but smooth blacktop surrounding it, you’re going to test-drive this car and think: “What the heck is that guy at CarGurus talking about? This car rides great!” Trust me. The moment you travel a less-than-perfect surface, you’re going to understand. Surprisingly then, the Accent SE is fun to toss around on a twisty mountain road, as long as you shut the stability control off. The stability control system engages so early and so frequently as to completely eradicate any possibility of taking a corner with too much speed. If it sounds like I didn’t much enjoy driving the Accent, you’re reading this right. The engine is spunky, the SE model’s 4-wheel-disc brakes are effective, and when driven at low speeds in the city or suburbs, or at higher speeds on a twisty road with the stability control disengaged, the Accent impresses its driver. But Hyundai engineers need to totally rethink the way this car is calibrated for every other driving situation. If you’re choosing the Accent for the warranty, my advice is to try a Kia Rio SX instead. It’s far more satisfying to drive and provides the exact same warranty coverage. In the first section of this review, I effusively described the level of quality provided by the Accent’s cabin, and this extends to how the doors and hatch sound when they are slammed shut, to the heft and refinement supplied by the controls, and the level of comfort afforded by the front seats. Generally, this car looks and feels “class above” in terms of how it is trimmed out, and nothing about the SE model’s interior instantly identifies the Accent as the cheapest vehicle in the Hyundai lineup. Finding a decent driving position behind the Accent SE’s leather-wrapped steering wheel is easy, though achieving maximum comfort is impossible, because the steering column isn’t telescopic, the seat offers basic 6-way manual adjustment, and the spots on the door panel that the driver is most likely to use as an armrest are rock hard. Nevertheless, the steering wheel is pleasing to hold, the center console armrest is softly padded and slides forward to aid comfort levels, and the height adjuster helps to ensure a good view out. The rear seat is less hospitable. It sits low in the car and provides tight legroom, and hard plastic trim on the front seatbacks is unkind to adult knees and shins. I installed forward-facing child safety seats and, predictably, my children constantly kicked those hard plastic trim panels. Not surprisingly, given that the Accent is a fairly simple car, its control layout is straightforward, logically arranged and clearly marked. At night, the gauges are clear white, while the steering wheel and center-stack controls glow in a soothing blue. Notably, all 4 power window switches on the driver’s door panel are illuminated after dark, yet another example of Hyundai’s attention to design detail. The Accent Hatchback has no trouble accommodating cargo. Stack the trunk to the roof and glass, and it will hold 21.2 cubic feet of cargo, easily on par with a full-size family sedan like the Ford Taurus. 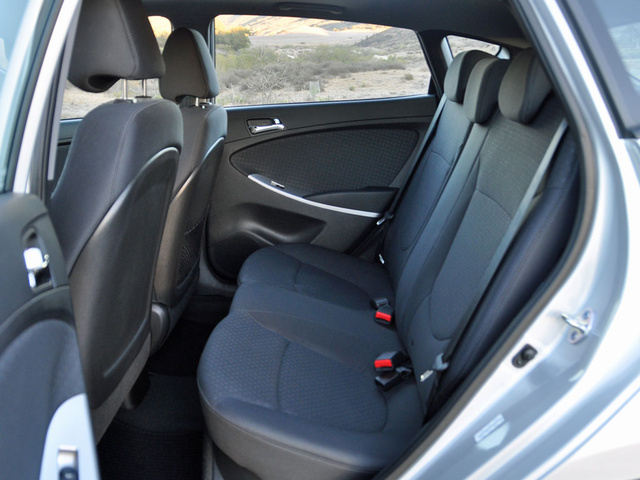 Fold the 60/40-split rear seat, and the Accent swallows 47.5 cubic feet of your stuff. By comparison, the Accent sedan’s trunk measures 13.7 cubes. 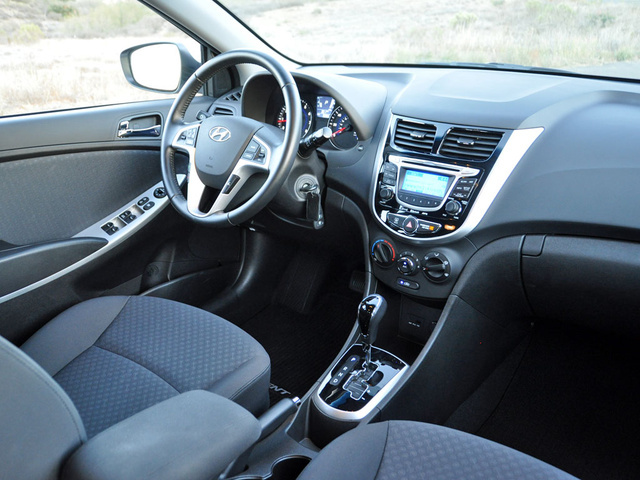 Every Hyundai Accent is equipped with satellite radio, an iPod connection, an auxiliary audio input jack and a USB port. Bluetooth connectivity is optional for the Accent GLS Sedan and standard for the Accent SE Hatchback. The GS Hatchback model, inexplicably, cannot be optioned with Bluetooth. A couple of years ago, a technology list like this one was enough to make the Accent appealing. Other automakers, however, are realizing that younger people are likely to buy an inexpensive car such as this, and they demand far more sophisticated technologies in their vehicles. 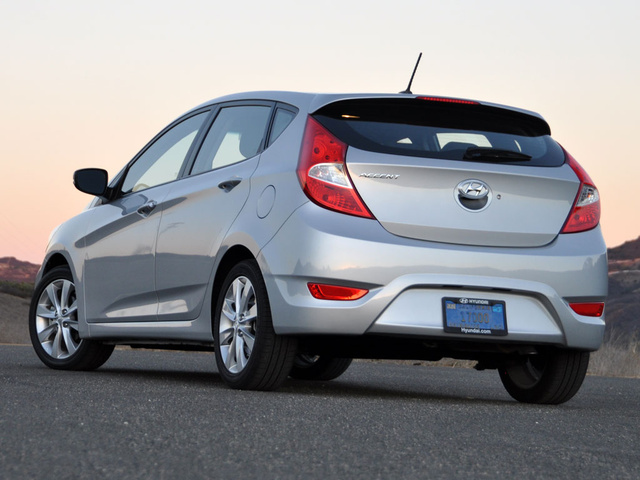 That leaves this Hyundai trailing competitors such as the Chevrolet Spark and Sonic, the Ford Fiesta, the Honda Fit and the Nissan Versa Note. Even the Kia Rio SX, the Hyundai’s corporate sibling, can be equipped with a reversing camera, a UVO infotainment system with a touchscreen display, a navigation system, a Smart Key entry system with push-button start and more. Unless Hyundai does something to rectify this situation in 2014, the Accent is going to fall even further behind the competition. As far as safety is concerned, the Hyundai Accent covers the basics. It's got 6 airbags, traction and stability control, antilock brakes with electronic brakeforce distribution and brake assist, and active front head restraints. In other words, the Accent supplies everything the federal government says it must—and nothing more. That approach used to be expected and acceptable in a small, inexpensive car, but just as the Accent doesn’t offer the level of technology that is available in some direct competitors, neither does it offer safety features equivalent to many modern entry-level cars. That would be okay if the Accent had proven itself to be a crash-test rock star, but it’s not. The Accent receives a 4-star overall crash-test rating from the National Highway Traffic Safety Administration (NHTSA), a rating that is applicable only to vehicles in roughly the same weight class. The Accent weighs anywhere from 2,396 to 2,654 pounds, depending on body style, trim level and equipment. When buying a car this light, you want a 5-star rating at the very least. 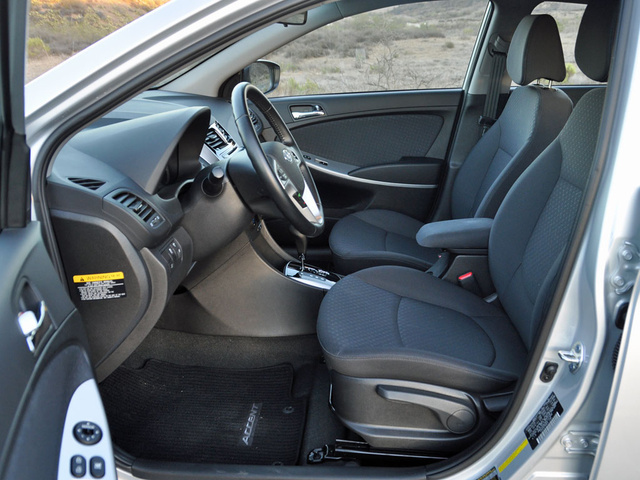 Additionally, the NHTSA cites a safety concern related to side-impact protection for rear seat passengers. In this individual metric, the Accent receives a 3-star rating, and the NHTSA notes that the car’s rear door intruded far enough into the cabin to impact the crash dummy’s torso. Therefore, I don’t recommend the Accent for carrying children. The Insurance Institute for Highway Safety (IIHS) is less critical of the Accent’s crash-test performance. The car earns the top rating of “Good” in the moderate overlap frontal-impact test, the rear-impact injury prevention test and a roof crush strength test. In the side-impact test, the Accent receives an Acceptable rating, precluding it from earning a Top Safety Pick designation. As this review was written, the IIHS had not performed its tough new small-overlap frontal-impact test on the Hyundai Accent. If not for significant discounts, the Accent would not make a strong case for itself in terms of value. During my testing, the car fell 2.2 mpg short of the EPA’s estimate. Both Consumer Reports and J.D. Power predict that the Accent will deliver average reliability, and AOL Autos thinks the Accent’s overall cost of ownership will be average despite its class-leading warranty. As this review is written, though, Hyundai dealers are offering up to $1,500 in rebates, loyalty coupons, and competitive conquest coupons. That means a customer can walk into the dealership, offer to pay invoice price for the car, and put a good chunk of money down on a loan. Now consider that ALG gives the Accent a 4-star rating for its ability to retain its value over time, and this otherwise average car suddenly becomes much more cost-effective to own. 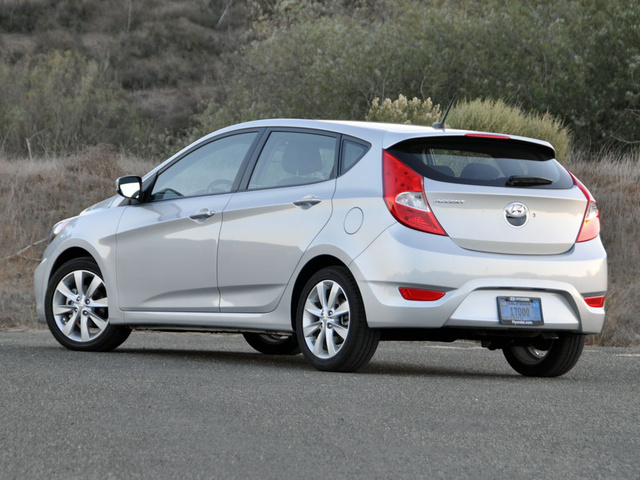 What's your take on the 2013 Hyundai Accent? 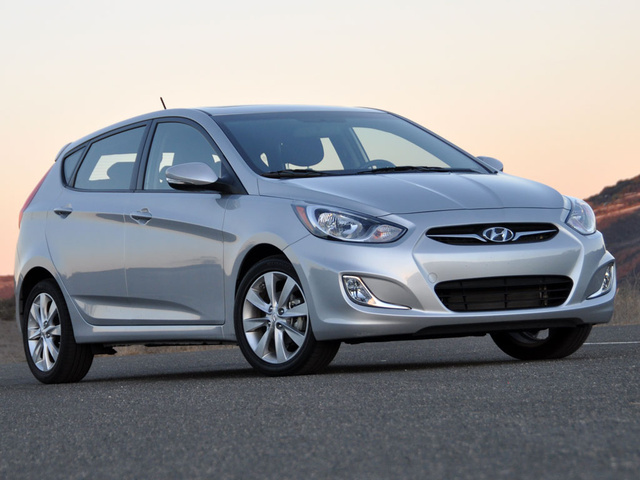 Users ranked 2013 Hyundai Accent against other cars which they drove/owned. Each ranking was based on 9 categories. Here is the summary of top rankings. 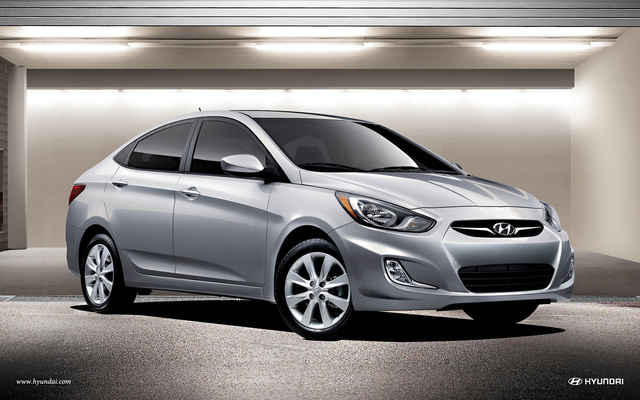 Have you driven a 2013 Hyundai Accent? 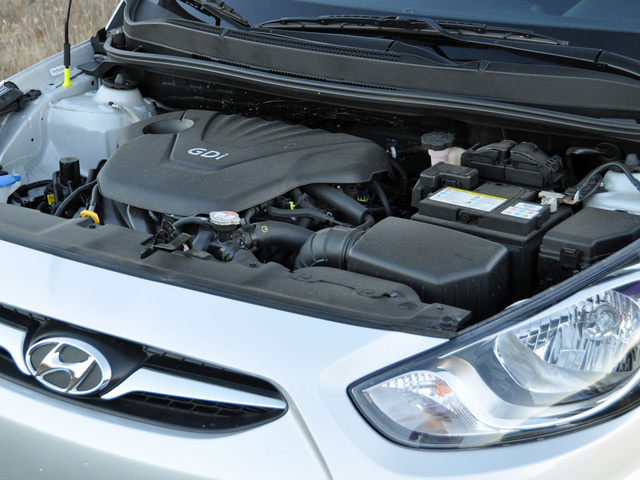 What does read fault code : hyundai accent b1625 ECM reception error or ECM DATA ERROR (historic) Means ? !